FILE - This photo provided by KATU-TV shows a wildfire as seen from near Stevenson, Washington, across the Columbia River, burning in the Columbia River Gorge above Cascade Locks, Oregon, Sept. 4, 2017. Wildfires that are blackening the American West in one of the nation's worst fire seasons have ignited calls, including from Interior Secretary Ryan Zinke, to thin forests that have become so choked with trees that they are at "powder keg levels." The destruction has exposed old frictions between environmentalists and those who want to see logging accelerated, and it's triggered a push to reassess how lands should be managed to prevent severe wildfires. 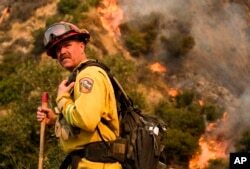 Zinke's directive Tuesday for department managers and superintendents to aggressively prevent wildfires was welcomed by Ed Waldron, fire management officer at Crater Lake National Park in Oregon. Waldron was exhausted after fighting two fires that have been burning since late July in or near the park, whose centerpiece is a lake that fills the remains of an erupted volcano and is the deepest in the United States. But he wondered where the additional resources would come from to hire contractors to thin the fuel. For now, Waldron and other firefighters have been too busy fighting blazes that forced the closure of a road into the park to thin vegetation elsewhere. "We've been working hard," he said Tuesday. "It's day 50." FILE - A crew member with California Department of Forestry and Fire Protection battles a brushfire on the hillside in Burbank, Calif., Sept. 2, 2017. For decades, logging was king in the West, notably in Oregon, which is famed for its majestic ponderosas and towering Douglas firs. But restrictions on harvesting timber from federal lands to protect endangered species and lower demand led to a freefall in the industry starting around 1990. Meanwhile, wildfires — nature's way of thinning and regenerating forests — were being extinguished instead of being allowed to burn. The forests grew too thick, and they began to overlap, covering meadows and other areas. "We've allowed forests to develop that never developed naturally," said John Bailey, a professor of fire management at Oregon State University in Corvallis. There is now a record amount of fuel for fires, such as brush, and "as a result, we have longer and hotter fire seasons that drive these megafires," he said. He advocated thinning forests through logging, prescribed burns and allowing naturally occurring fires to be managed instead of extinguished. A fire becomes a megafire when it reaches 156 square miles (404 square kilometers). A megafire in southwest Oregon is the largest blaze in the West, having burned 290 square miles (751 square kilometers), authorities said Wednesday. It was reported July 12 and isn't expected to be under control until Oct. 15. Across the West, more than 12,000 square miles (31,080 square kilometers) have burned this season, making it among the worst in land scorched. Oregon state Sen. Herman Baertschiger Jr. called for a work group to revamp fire policy. FILE - This image taken from video provided by KGW-TV shows fire damage to the area surrounding the Angel's Rest trail in the Columbia River Gorge near Cascade Locks, Oregon, Sept. 7, 2017. "The inability to manage our forest resources due to environmental concerns is threatening the safety and well-being of Oregonians and ultimately damaging our beautiful state," the Republican said last week. Residents of several communities in southwest Oregon opposed to a planned federal sale of old-growth trees say logging the fire-resistant timber will increase the risk of blazes spreading to communities. They say younger, uniform trees that will grow densely there will be twice as likely to burn. A coalition of residents will protest the sale Thursday in the town of Grants Pass. "As fires burn throughout the region, area residents believe maintaining our last fire-resistant, old-growth forest is increasingly critical," the coalition said in a statement Wednesday. U.S. Sen. Ron Wyden, an Oregon Democrat, has denounced inadequate efforts to thin dead and dying trees, calling it a yearslong pattern. He urged smarter policies, criticized the "broken system of fighting wildfires" and complained that federal funds earmarked for fire prevention are instead used for firefighting. "The idea of ripping off prevention, which you need most, defies common sense," Wyden said on the Senate floor last Thursday, standing next to a large photo of flames leaping from trees in Oregon's Columbia River Gorge. "Shoddy budgeting today leads to bigger fires tomorrow." Bailey, the fire management professor, lamented that Zinke's directive does not recommend using fire as a tool to restore forests. Oregon Wild, which campaigns for conservation of roadless areas, suspects an ulterior motive behind the order from Zinke, who oversees more than 500 million acres of federal land, though the Forest Service, a unit of the Agriculture Department, is the nation's largest firefighting agency. "Sadly, policy will be all about more logging, not better fire management," Oregon Wild tweeted. In Montana, environmental groups last month sued over a proposal by the U.S. Forest Service to allow timber harvesting and some prescribed burning to reduce the risk of severe wildfires in the Flathead National Forest. The lawsuit argued the agency failed to analyze how the timber project, combined with another one nearby, would affect Canada lynx, grizzly bears and their habitat. Forest fuels are at "powder keg levels," Paul F. Hessburg Sr., a U.S. Forest Service research landscape ecologist, recently told an audience in Bend, Oregon, a former logging town that has remade itself into an outdoor recreation and microbrew mecca. "If we don't change a few of our fire management habits, we're going to lose a few of our beloved forests," he said.